Mood board: 2017 sees the 100th anniversary of the house of Balenciaga, a triumph being marked in exhibitions globally throughout the year, from the ‘Balenciaga: L’Oeuvre au Noir’ exhibition opening at the Musée Bourdelle in Paris on 8 March, celebrating the designer’s use of black, to the ‘Balenciaga: Shaping Fashion’ exhibition opening at the Victoria and Albert Museum in London in May. Cristóbal Balenciaga had each of his haute-couture collections photographed, and it was this image archive that Demna Gvasalia delved into for A/W 2017, reintroducing the house’s made-to-order history with a series of archive-inspired dresses, some with oversized peplum details or huge bows at the waist, each labelled with the year, collection and garment description on its back. Best in show: From the trapeze-shaped baby-doll dress, to the tulip silhouette, Cristóbal was renowned for his avant-garde approach to the female form, and floral detail and polka dot designs echoed shapes within the Spanish designer’s archive. The collection also opened with a series of coats, buttoned aysmmetrically at an angle to the side of the body, in mannish checks, leopard prints and leathers. 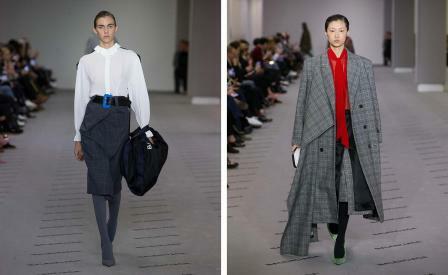 They reflected a modern and more angular take on Balenciaga’s subversive approach to form. Finishing touches: Preoccupied with repurposing mundane materials, which formed a modern contrast to the archive haute couture shapes in the collection, Gvasalia revealed vehicle mats wrapped as skirts, nylon tire covers carried as totes and wing mirrors reimagined as reflective evening bags.